REVIEW: Spider-Gwen #26 – "Nothing Left to Fear"
To find the answers she seeks, Gwen must go back to the beginning. Back to Cindy Moon. Plot: Still living with the Venom symbiote, Gwen gets the help of Reed Richards to seek out Cindy Moon to understand why she created Spider-Gwen. Meanwhile, the police and Gwen’s friends continue to search for her. Eventually, S.H.I.E.L.D. joins the hunt as well. Story: A strong intro establishes how erratic Gwen’s behavior has become and we once again get a glimpse of her growing loss of identity through her internal monologue. But one of the best choices of this issue isn’t about Gwen, it’s about the people Jason Latour surrounds her with. After feeling so alone, Gwen starts to seek out help. This gives the perfect excuse to reintroduce some standout characters from earlier in the series. 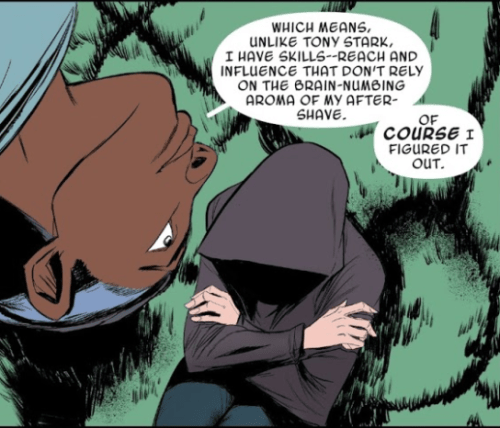 In a much-appreciated move, wunderkind Reed Richards replaces some of the humor we’ve lost when the Venom symbiote took over Gwen. The use of Cindy Moon in this issue is especially interesting. When Gwen goes looking for her, you expect a big confrontation. But that’s not what you get. Instead, Cindy serves as the voice of reason for Gwen, telling her that her anger doesn’t make her stronger but weak. 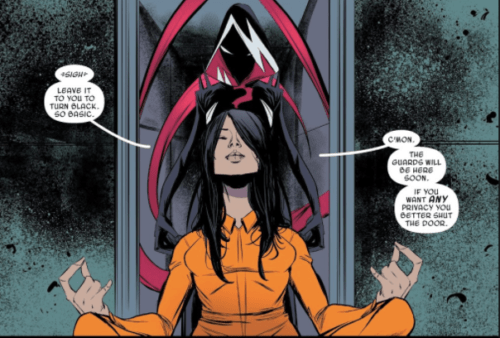 The role reversals in this issue remind the reader that Gwen is a flawed hero and her return from darkness isn’t inevitable, it’s something she has to chose. The meeting with Cindy has a huge effect on Gwen, but Latour has one more twist up his sleeve. 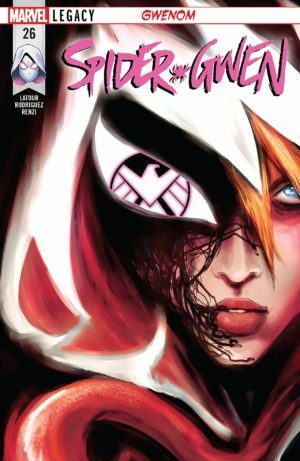 When Gwen meets up with one more character from early in the run who was also defeated by Matt Murdock, the reader is left with uncertainty over Gwen’s next move. All the parts of Gwen’s life: S.H.I.E.L.D., the police, her family, the Mary Janes and even the Parkers begin to converge. With so many players on the board, there are a lot of directions this arc could go and I’m enjoying the unpredictability. Art: Robbi Rodriguez continues to capture the movement of Gwenom and find the beauty in something so dangerous. The tongue vacillates between looking like a weapon and a ribbon used for rhythm gymnastics. The panel below really highlights the role reversal of the narrative between Gwen and her enemies. In the moments we see Gwen’s face behind the mask, you can see her pain and conflict so clearly. Her posture, like in the scenes with Reed, also betrays her emotions. The recurring missing person poster asks “Have you seen our friend?” and in a way, we haven’t. The visual device reminds us there are two parts fighting for control of Gwen and we have yet to figure out who will win. I really enjoy Rico Renzi’s use of black for the Gwenom arc. Instead of saving it just for her costume, the black seeps throughout the panels like a mold covering the backdrops just as the symbiote seeps through Gwen. The darkness gets broken up with the panels without Gwen, and especially with the S.H.I.E.L.D. characters, you get a glimpse of the old, happy-go-lucky neon palette. Verdict: In my opinion, Spider-Gwen has never been better. They’ve been building towards this arc for some time, but the creative team on this book has gone even farther recently to prove this book can be more than what readers have come to expect. In addition to strong story development, Spider-Gwen #26 brings back a lot of characters we haven’t seen in a while which makes it a fun read. If you haven’t picked up the book in a while, I’d strongly encourage you to catch up so you’ll be there to see the ending Gwenom. Tags: Cindy Moon, Gwenom, Jason Latour, Reed Richards, Rico Renzi, Robbi Rodriguez, S.H.I.E.L.D., Spider Gwen, Spider-Gwen #26, VC's Clayton Cowles, Venom? 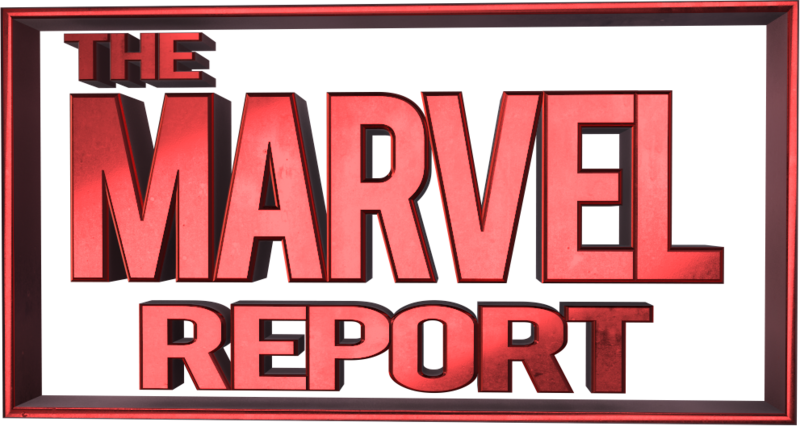 Marvel’s Contest of Champions Pops Coming Soon!